Have had v.6.0.2. on my computer for years. The trial nag screen opens with any native "Reveal in Finder" functions. When I select Buy Later, the app opens in the menu bar, but nearly all of the options are greyed out (including Preferences), and no window opens. Functionality may have been lost from previous attempts to remove using AppCleaner. 5 years is enough time, let's get it fixed!! Which version of MacOS do you have Installed? Is it Mojave? 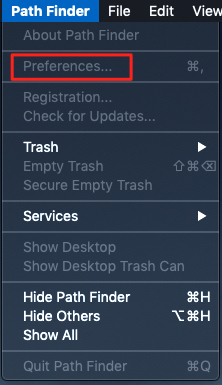 I'm afraid Path Finder 6 will not work with MacOS Mojave. Path Finder Support Team closed this discussion on 26 Mar, 2019 06:12 PM. Yes it is Mojave. Not trying to get it to work, trying to uninstall it. Have not used it for years but there was never a clean uninstall and it is incorporated into core system functions and needs to be removed. Please, Install Path Finder 8 trial, then go to Path Finder > Preferences > General and uncheck the "Set as the default browser" box. This should help to remove this behavior. You may then uninstall Path Finder 6. You are welcome to keep trialing Path Finder 8 or uninstall it as well after the issue is resolved. Path Finder Support Team closed this discussion on 27 Mar, 2019 09:16 AM. Have already attempted that. Those settings are disabled in PF8. And yet the issue persists. Path Finder Support Team closed this discussion on 27 Mar, 2019 10:43 AM.